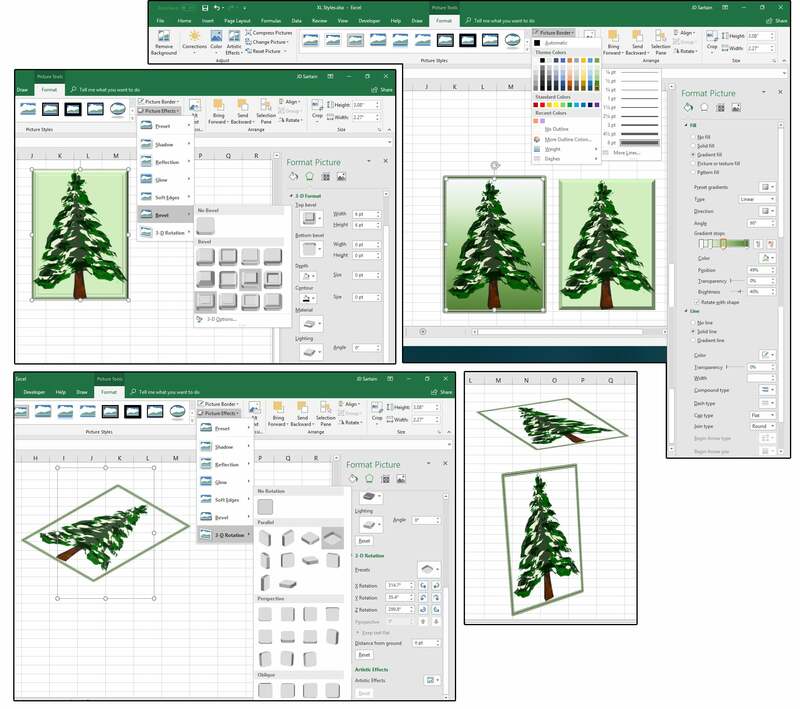 The “graphics” in Excel refer to the icons accessed through Insert > Icons, which takes you to a sizable library of miniature shadow images (similar to the fancy symbols and bullets in the Symbols library). The difference here is that one is a graphic (icons) and the other is a font (symbols). Once upon a time, fonts and graphics were not interchangeable. 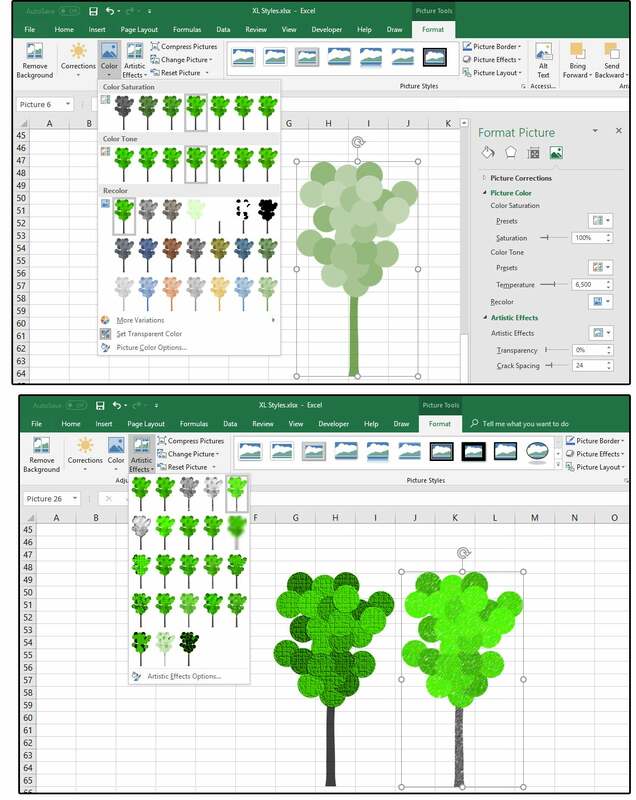 Now, finally, you can covert a symbol to an icon or a graphic or a picture using a third-party program such as Illustrator, Photoshop, or a paint program, then copy and paste the converted symbol into Excel. Excel hasn’t quite made that leap yet but, in some new future version, I am certain that feature will be added. 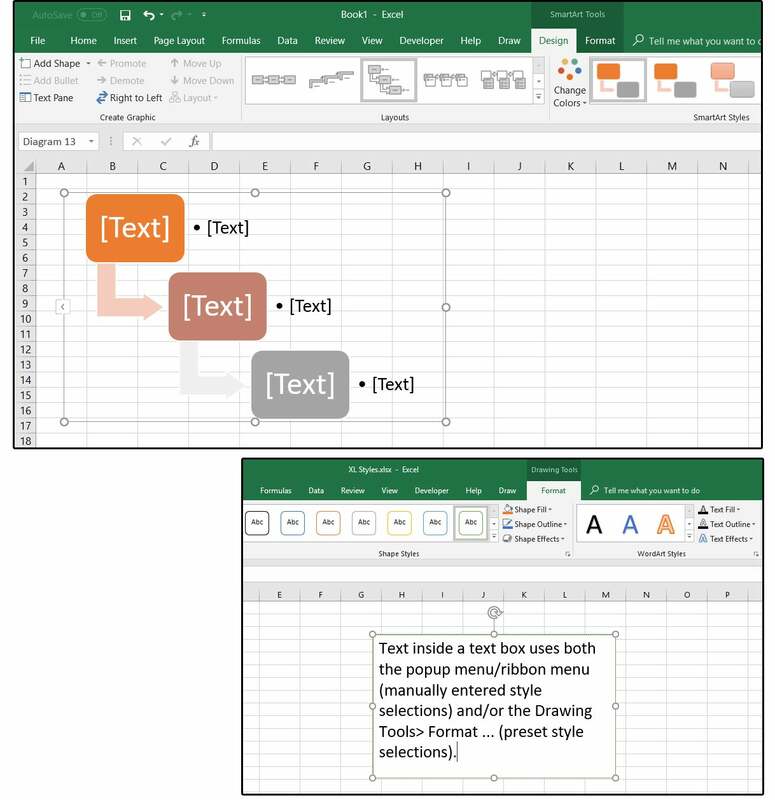 NOTE: You can create custom bullets using symbols, fonts, and pictures in MS Word, then copy and paste them into Excel as “pictures,” which can then access all the graphic/picture features. Note that some fonts work and some do not. See the next section on Picture Tools for instructions about this process. 1. For example, in MS Word, select Home > Paragraph, then click the Bullets button expansion arrow (top left in the Paragraph group) > Define New Bullet. When the New Bullet window appears, choose Symbol, Picture, or Font to create your custom bullets. Note that not all fonts work. 2. First, click the Picture button and choose an image from Bing search or from a file on one of your drives. After it drops into your document, select a symbol, and then a font. Highlight all three and change the size to 100 points (or so), then Copy and Paste into Excel. 3. 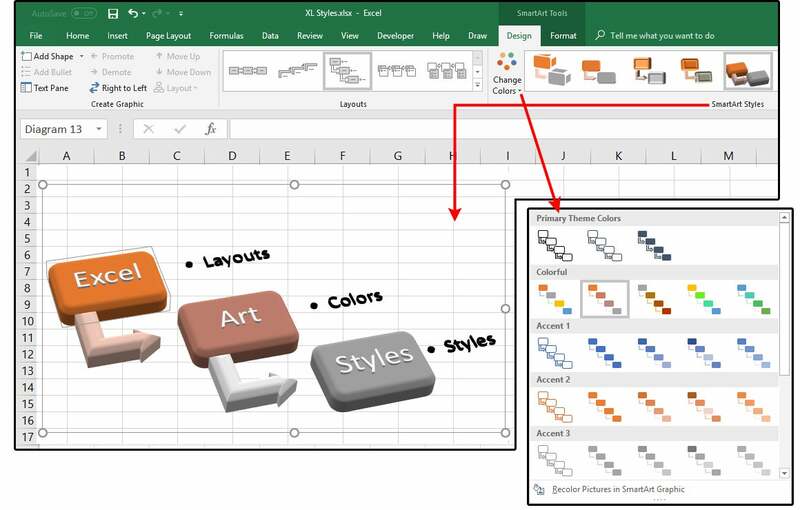 Once in Excel—if the bullet picture has handles—you can edit it, change colors, format it, and apply Artistic Effects like you can with any other graphic or picture. 4. Next, let’s try some icons. Select Insert > Icons (from the Illustrations group) and browse through the images or select a category on the left to narrow your search. 5. Choose an icon you like or need for your project, then click the Insert button. 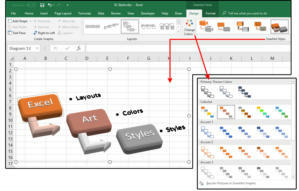 Excel drops the icon onto your spreadsheet with the sizing handles active. Click one of the handles and drag down and over to make the icon larger. 6. Again, notice that the Ribbon menu displays a new tab called Graphic Tools > Format. With your icon still selected, choose a Graphic Style or the Fill, Outline, and/or Effects (such as shadow, bevel, glow, etc.) buttons to “decorate” your icons. You can also resize it from this menu plus Rotate, Crop, Group, etc. You can also convert your icons (which are graphics) into Shapes so you can break them apart and edit the “ungrouped” pieces. 7. Insert another Icon from the Icons library. 8. 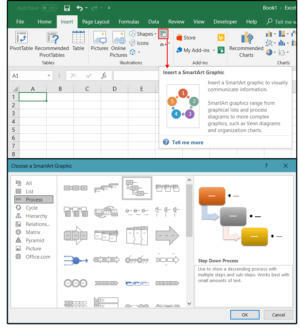 With it still selected, choose Graphic Tools > Format > Convert to Shape (from the Change group, far left side of Ribbon menu). 9. In the popup dialog that says: … Imported Picture…Do you want to convert to a Microsoft Drawing Object? Click Yes. 10. Notice that the Graphic Tools tab now says Drawing Tools. Also notice that some of the pieces in the graphic now have separate sizing/selection handles. In my fishbowl, the fish is now a separate graphic. I can move it, copy and paste it somewhere else, change the Colors (Gradients or Patterns) and Outline separately from the fish bowl. 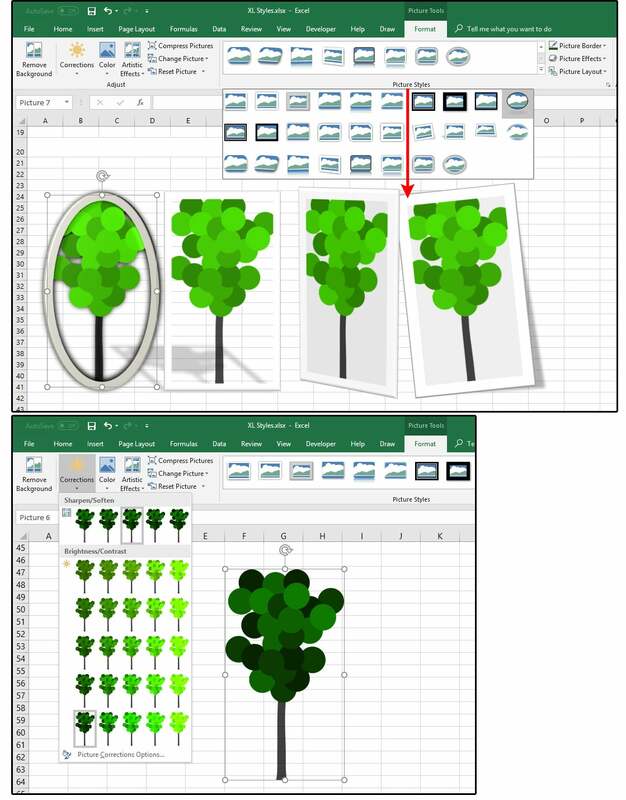 NOTE: If some of the items fail to “separate” during the conversion process, ensure that the graphic is still selected, then choose Drawing Tools > Format > Group > Ungroup (from the Arrange section). 1. For Pictures, choose Insert > Pictures (from one of your drives), navigate to the correct folder, select the image, and click the Insert button. Or, choose Insert > Online Pictures and enter a keyword/search term in the Bing search box. Press Enter or click the magnifying glass. Browse through the options, select an appropriate image for your project, then click the Insert button. 2. Excel drops the picture onto your spreadsheet. The Picture Tools/Format tab and a menu appears with all the cool features you can use to enhance your pictures, such as Picture Styles; Adjustments for Brightness/Contract and Sharpen/Soften Corrections; Color, Saturation, and Tone adjustments; Artistic Effects; Remove Backgrounds; and Compress, Change, or Reset Picture. NOTE: And here is where Excel really excels in the graphics arena! In the early years, Microsoft’s graphics were horrendous. Everything was low-resolution and there were no effects or color corrections, or styles. 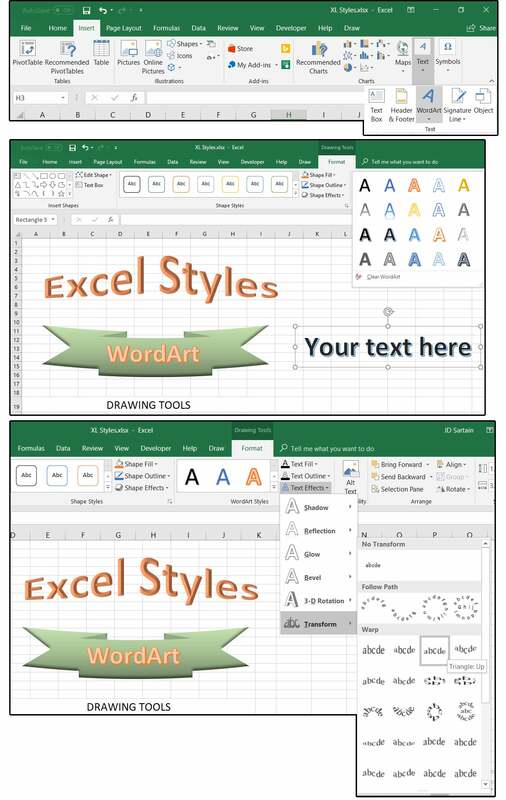 Now, Excel rivals some of the best graphic programs out there in features and effects. It still has its limitations but, wow, what a difference. 3. To sharpen or soften the image or adjust the brightness/contrast, select the image first. 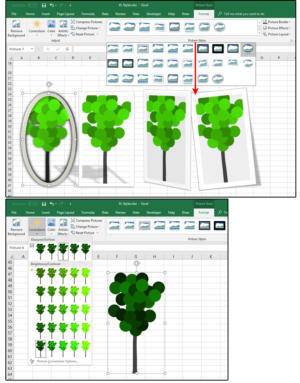 From the Picture Tools/Format tab, click Format (for the menu), then choose Corrections from the Adjust group. 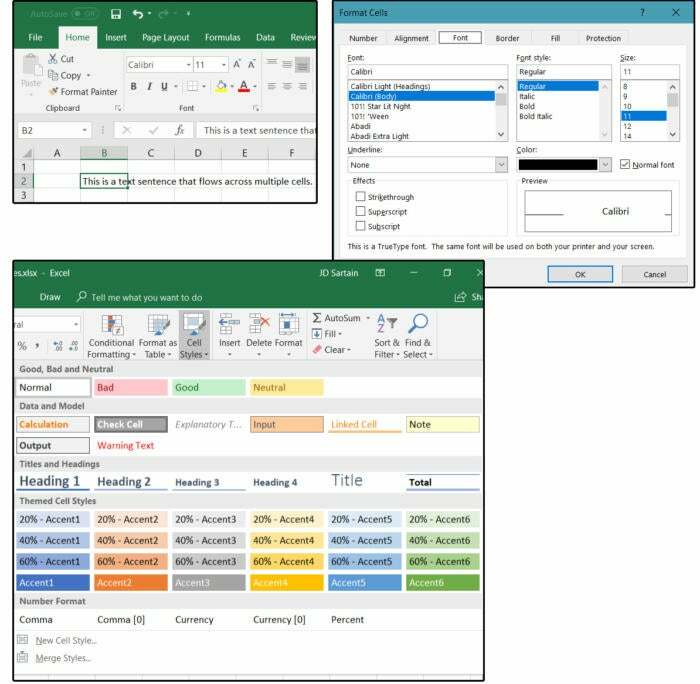 Excel displays a drop-down menu with five Sharpen/Soften options and 25 Brightness/Contrast options. Browse through the list and choose one that works for you. 4. Next, choose Picture Tools/Format tab > Colors from the Adjust group. Excel displays another drop-down menu with seven options for Color Saturation, seven Color Tone options, and 21 options to Recolor (or change the images colors). Sharpen/Soften options and 25 Brightness/Contrast options. Browse through the list and choose one that works for you. 5. For Artistic Effects, choose Picture Tools/Format tab > Artistic Effects from the Adjust group. Notice the 23 effects displayed in the drop-down menu: Marker, Pencil Grayscale, Pencil Sketch, Line Drawing, Chalk Sketch, Paint Strokes, Paint Brush, Glow Diffused, Blur, Light Screen, Watercolor Sponge, Film Grain, Mosaic Bubbles, Glass, Cement, Texturizer, Crisscross Etching, Pastels Smooth, Plastic Wrap, Cutout, Photocopy, and Glow Edges. 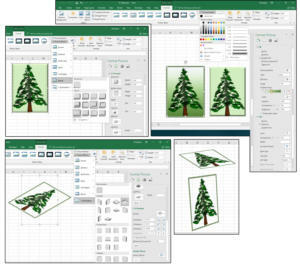 These are the same effects offered Word, PowerPoint, and most all graphics and photo editing software programs including Photoshop, Paint Shop Pro, Corel Draw, Corel Paint, and dozens of others. 6. We selected Cement for the first graphic and Line Drawing (in color) for the second image. If you select the Artistic Effect menu item at the bottom of this list, the Artistic Effects feature options appear at the bottom of the Picture Format panel with addition options for these effects. 7. Insert another picture, then choose Picture Tools/Format tab > Picture Styles group > Picture Border button. For Color or Border options choose Weight > More Lines, and the Format Picture panel opens on the right. Choose a Line (Solid or Gradient), Line Color, Line Design, (Compound and/or Dash), Cap Type (Square, Round, Flat), and/or Join Type (Round, Bevel, Miter). Try them all and see which ones you prefer. 8. For Picture Effects—not the same as Picture Styles or Artistic Effects; however, you can use both in combination with Picture Effects, which include Presets (a sampling of all), Shadow, Reflection, Glow, Soft Edges, Bevel, and 3D Rotation. 9. Copy your picture two more times. For the first one, choose Picture Tools/Format tab > Picture Styles group > Picture Effects button. Choose a Bevel design from the Bevel menu: I chose Divot. 10. Select the second copied image and, from the same menu, click 3D. The drop-down menu provides five options: No Rotation, Parallel, Perspective, Oblique, or 3D. Notice that the same options appear under the Presets button on the Format Picture pane. But also notice the X, Y, and Z Rotation buttons, the Perspective button, and the Distance from Ground feature. Use these buttons to completely customize the rotation of your picture. 11. The rest of the Picture Effects are self-explanatory, so play with them and see what happens. 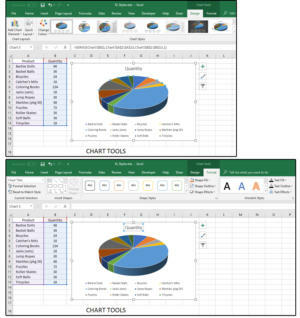 Once again, the chart must be selected for the Chart Tools tab to appear. Notice this one has two sub-tabs: Design and Format. And, to see the complete Format menu, you must also select some text inside the chart graphic. 2. 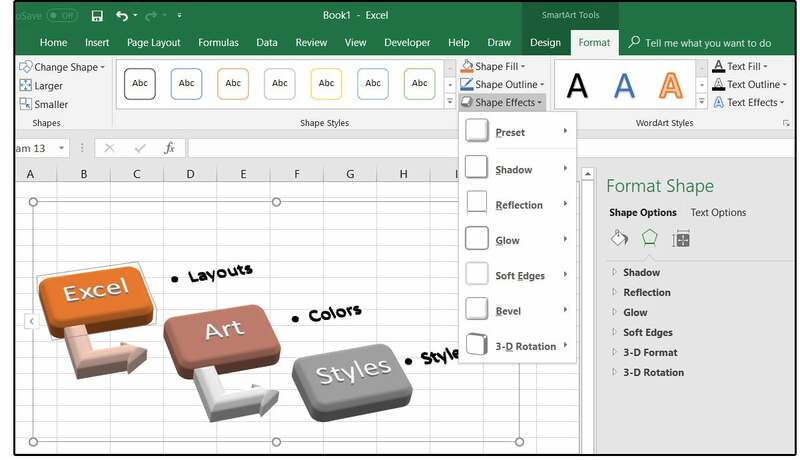 The Chart Tools > Format menu: Insert Shapes, Shape Styles, Word Art Styles, Arrange, and Size works just like the Format menus on Smart Art, Drawing, Graphics, and Pictures. Experiment with the features and options or see the Smart Art section above. 3. 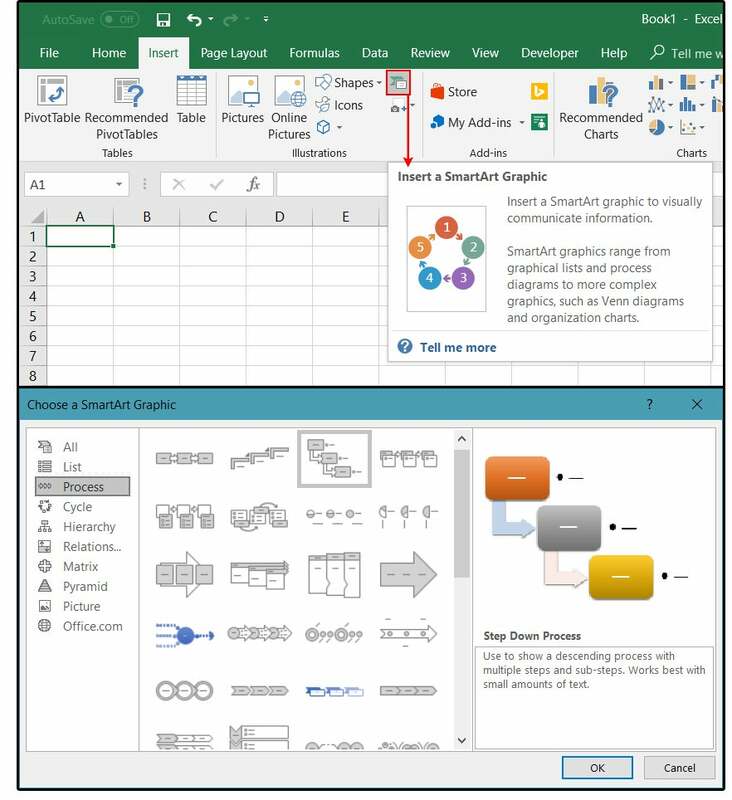 The Chart Tools > Design menu has Chart Layouts, Colors, and Chart Styles like the Smart Art Design menu. Once again, you can experiment with these features or see the Smart Art section above. 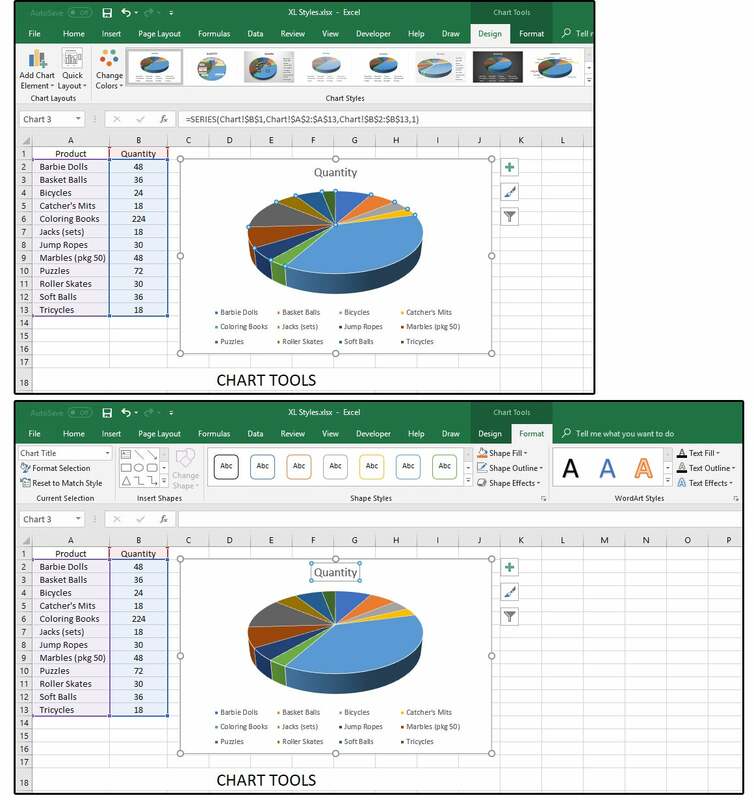 However, the rest of this menu: Data > Switch Row/Column, Data > Select Data; Type > Change Chart Type; and Location > Move Chart, affects Charts only and does not appear on the other Tools menus. These are also self-explanatory, but go ahead and experiment for future reference.